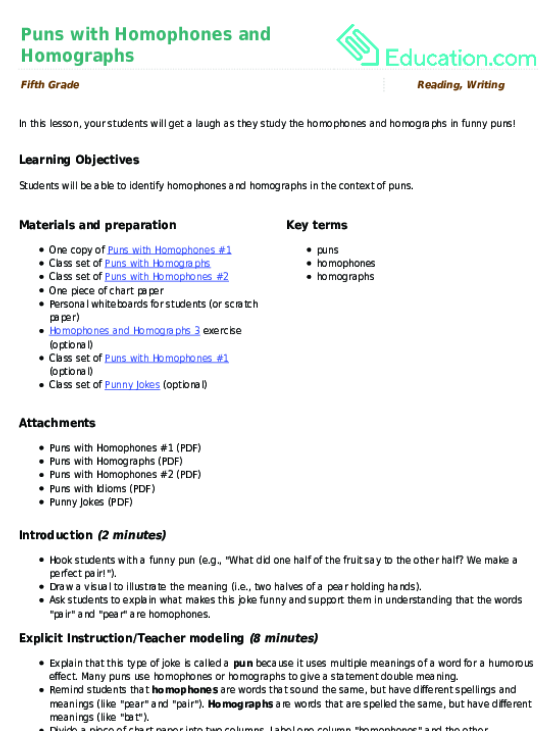 Students will be able to identify homophones and homographs in the context of puns. Hook students with a funny pun (e.g., "What did one half of the fruit say to the other half? We make a perfect pair!"). Draw a visual to illustrate the meaning (i.e., two halves of a pear holding hands). Ask students to explain what makes this joke funny and support them in understanding that the words "pair" and "pear" are homophones. Explain that this type of joke is called a pun because it uses multiple meanings of a word for a humorous effect. Many puns use homophones or homographs to give a statement double meaning. Remind students that homophones are words that sound the same, but have different spellings and meanings (like "pear" and "pair"). 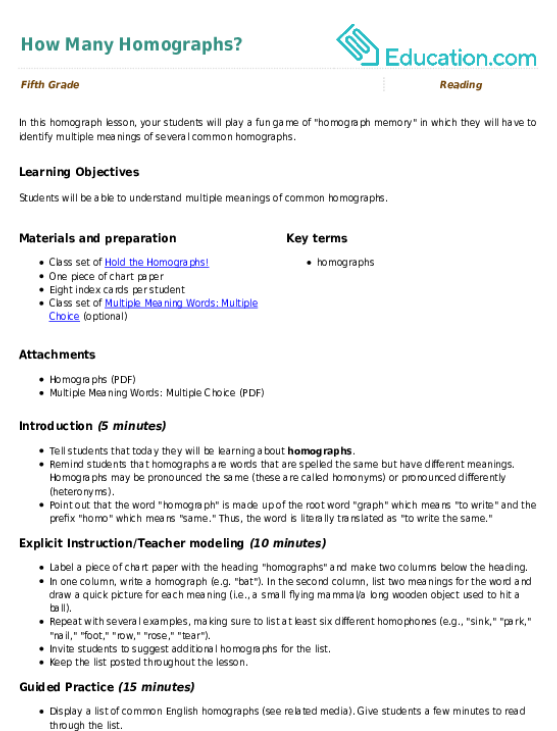 Homographs are words that are spelled the same, but have different meanings (like "bat"). Divide a piece of chart paper into two columns. 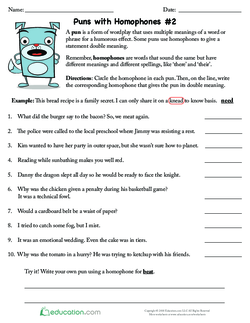 Label one column "homophones" and the other "homographs." With the class, generate a list of homophones and homographs to write in each column. Explain that this joke is a pun because the homophone "knead" gives the joke double meaning. 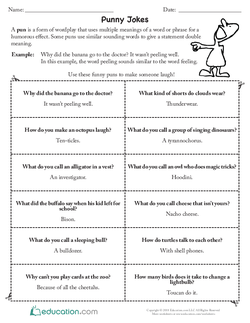 Display one copy of the Puns with Homophones #1 worksheet and work through it with the class. Then, give students a few minutes to work with a partner and come up with an answer for the "try it" question (write a pun with a homophone for "hair"). Model a pun with a homograph from the list (e.g., "Why did the teacher wear sunglasses? Because his students were so bright!"). Explain that this joke is a pun because the word "bright" can mean smart or shiny. 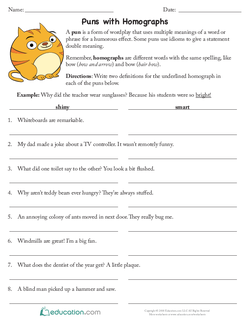 Hand out the Puns with Homographs worksheet and complete the first two puns with the class. Then, have students complete the rest of the worksheet with a partner. 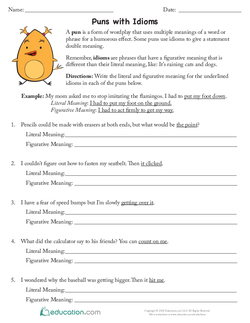 Hand out the Puns with Homophones #2 worksheet and instruct students to complete it independently. Use a digital exercise to give students additional practice identifying common homophones and homographs (see optional materials). Use visuals to support students' understanding with tricky multiple meaning words. Follow up by looking at puns that use idioms to create double meaning (see optional materials). Challenge students to come up with more puns on their own, using homophones or homographs to create double meaning. Invite your students to tell jokes with their classmates using puns (see optional materials). Write a word on the board, like "meat," and ask students to write its homophone on their personal whiteboard. Have students hold up their answers and scan student responses to gauge understanding. Repeat with several homophones that students used through the course of the lesson (e.g., "hare"/"hair", "rap"/"wrap," "pole"/"poll"). Write a homograph on the board, like "bug," and ask students to write two different meanings for the word. Repeat with several homographs that students used through the course of the lesson (e.g., "stuffed," "fan," "saw"). Invite students to share the puns they came up with on their worksheets during independent practice (puns using a homophone for "beat"). Your students will have fun identifying the homophones in these hilarious puns! This exercise will show students the difference between some of the most common homophones and homographs. This homographs worksheet will help your child sort out those words that look alike but sound different and mean different things. 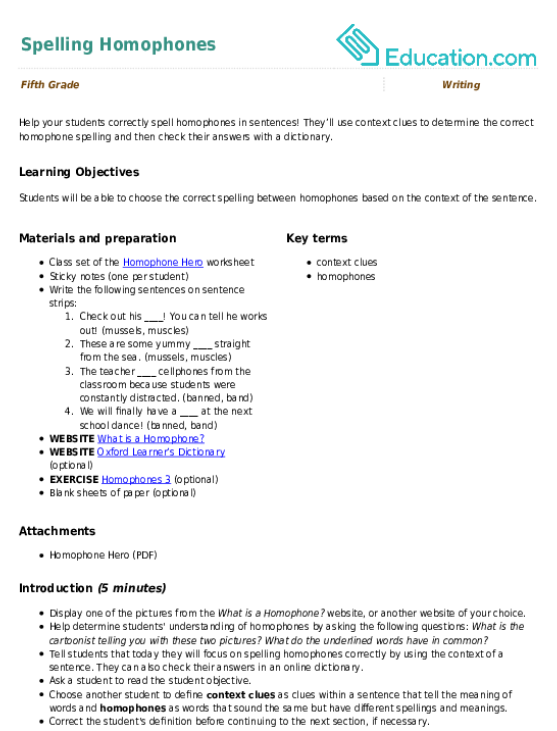 In this homograph lesson, your students will play a fun game of "homograph memory" in which they will have to identify multiple meanings of several common homographs. Help your students correctly spell homophones in sentences! They’ll use context clues to determine the correct homophone spelling and then check their answers with a dictionary.